The project aims at creating criteria for the development of wood products that meet all requirements towards look, functionality, recycling and reuse, and, after their last cycle of use, their potential to be employed as fuel. This way, the study is oriented towards the overall goal of wood management corresponding to the demands of sustainable economical management of resources. The goal of this research project was to develop criteria that can be used to improve the environmental sustainability of wood products. A cradle-to-grave approach was adopted and criteria were selected for each step in the value change from initial product design and manufacturing through reuse in secondary products and final combustion for heat and power, including use or disposal of ash. The project consisted of two parts: the first part focused on recycling of initial products into secondary wood products; the second part considered use of wood waste for heat and power. 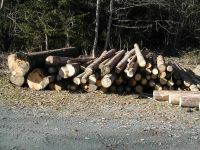 If waste wood is to be used in small-scale heat or power facilities, size and shape of products or product parts is also an important design feature. Production of heat and power is an attractive end use for wood waste as both environmental and economic benefits can be achieved. The amount of wood recovered in Austria increased from 619,000 tons in 1995 to 758,000 tons in 2003, and further increases are expected in the future. With a heating value of 5 GJ/ton, 758,000 tons corresponds to an energy value of about 12 PJ. This represents about 0.83% of the annual primary energy demand of 1,440 PJ in Austria (2005). The project was influenced by Action E31 (Management of Recovered Wood) of the European Cooperation in the field of Scientific and Technical Research (COST). The results of the project have been presented to and included in COST Action E31. Discussions with European experts have improved the quality of project results.